Central Florida is a prime location to plan your next family vacation. 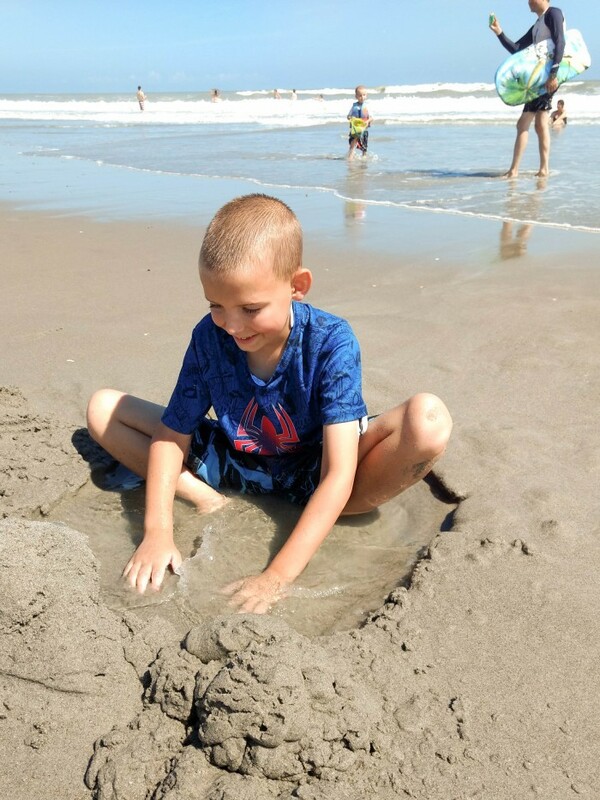 It feels like the ultimate family fun destination with so many attractions and fun that there is something for every family’s interests – outdoorsy, thrill-seekers, animal lovers, and of course beach bums. No matter what type of family vacation you’re seeking, Orlando is the perfect destination for your upcoming family vacation! 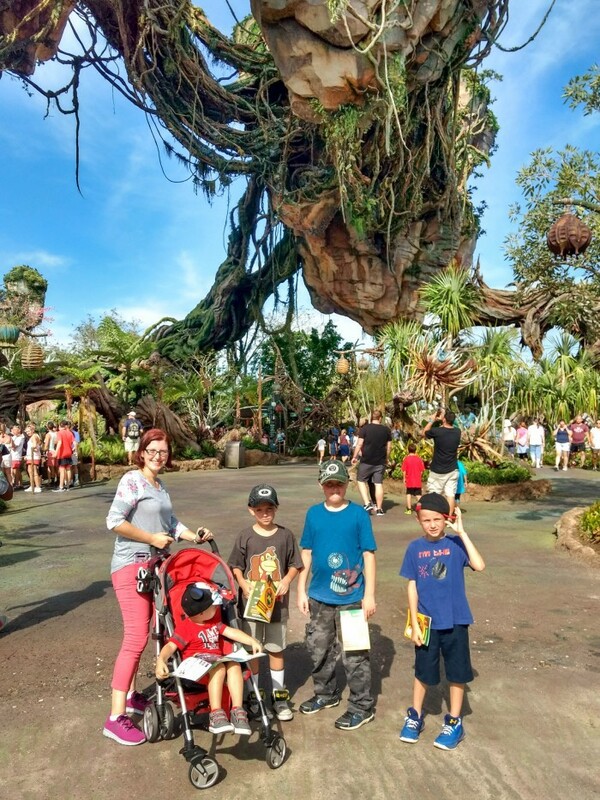 On our recent family trip, we planned a perfect Orlando itinerary that gave a mix of water, thrills, and a mix of local culture. You can use our itinerary as a perfect starting point for your own vacation planning for your own perfect family vacation. 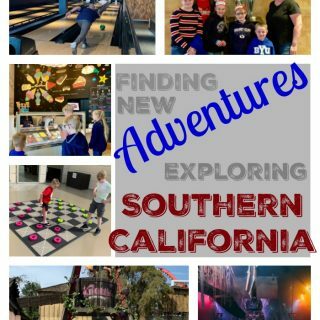 We received some complimentary admissions or media rates for select activities and our accommodations. Other attractions we paid for ourselves. All opinions are our own. Whether your family is driving or flying to Florida, your arrival day should be a low-key day without a lot of busy crowds or wait times. Start by checking into your resort and spend an hour or two to settle in and unpack if you’ll be staying for more than 4 days. Once settled, head out to do an airboat tour. 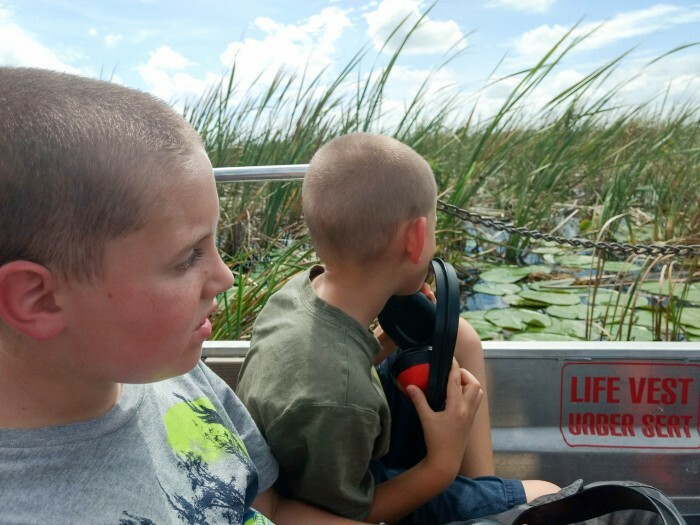 We choose Boggy Creek Airboats, as we’ve done an airboat tour with them in the past and enjoyed the trip. We were thrilled to see how their attraction has grown over the past 4 years to quite an operation. 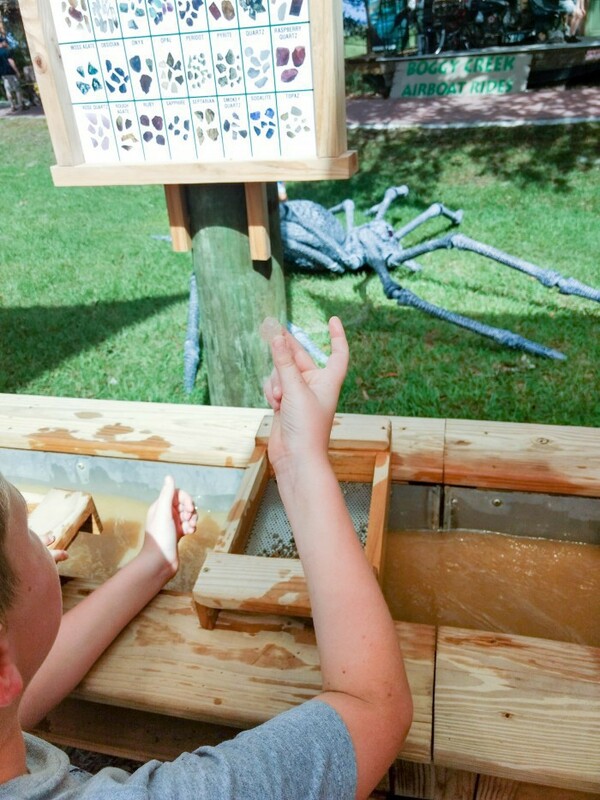 Their park now includes gem mining which was so much fun and some photo opps, baby gators, and even an educational aspect before your airboat tour begins. The airboat tour is such a fun way to experience what Florida is known for – marshes and alligators. It’s impressive to see the boat glide right over the plants and growth in the water. We spotted a large alligator and lots of birds including herons and cranes. If you have a late afternoon or evening arrival, you can count your official day one as the next day and add in spending time at the pool to your itinerary. By your second day, you’ll be ready to hit a big theme park. 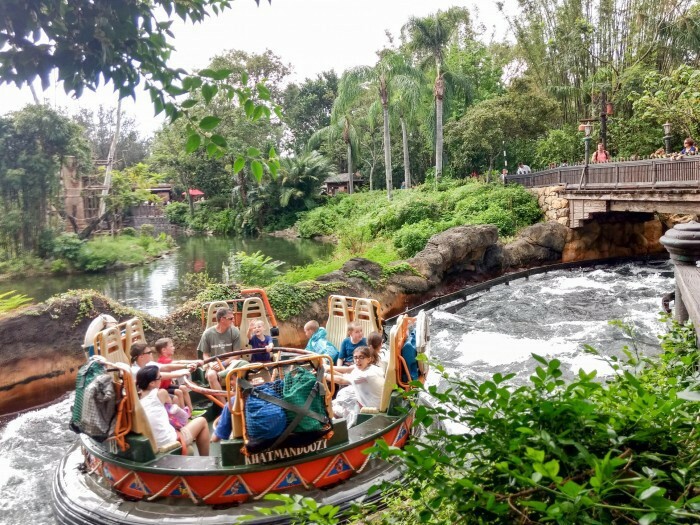 One we recommend that the whole family will enjoy is Disney’s Animal Kingdom. 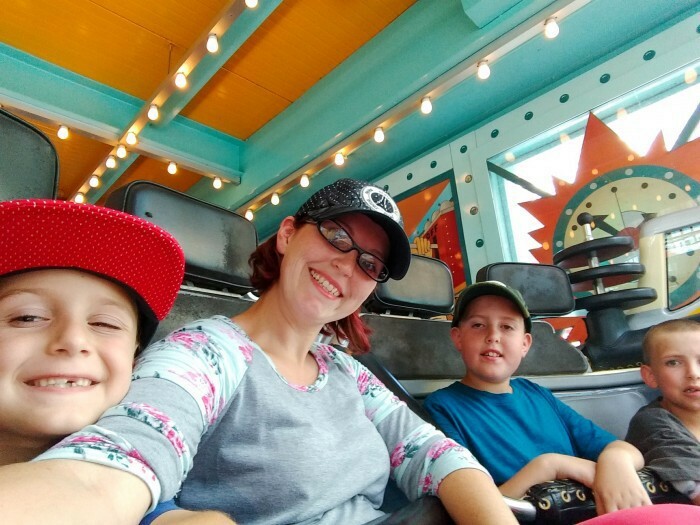 It provides a good mix of coasters, shows, and other attractions with one-of-a-kind experiences and a beautifully themed park that’s just fun to wander and enjoy. We started in Pandora – The World of Avatar, the newest addition to the park. It’s an incredibly beautiful area of the park that really makes you feel like you’ve stepped into the movie. We had to go home and watch Avatar after experiencing the world and that brought the fun of our trip home with us. There are really long lines for Avatar Flight of Passage (sometimes it was 3 hours or longer) but we did go on the Na’vi River Journey which has all the bioluminescent plants and animals like the show and is a nice gentle ride the whole family can go on. One thing we noticed while in the parks is that the ride lines have really improved! There are interactive things to read, see, or do while in the different lines and even a drinking fountain and plenty of shade that makes your wait time much easier to manage. Still, with Fast Pass the longest we waited in any of the lines was no more than 40 minutes, many much shorter. 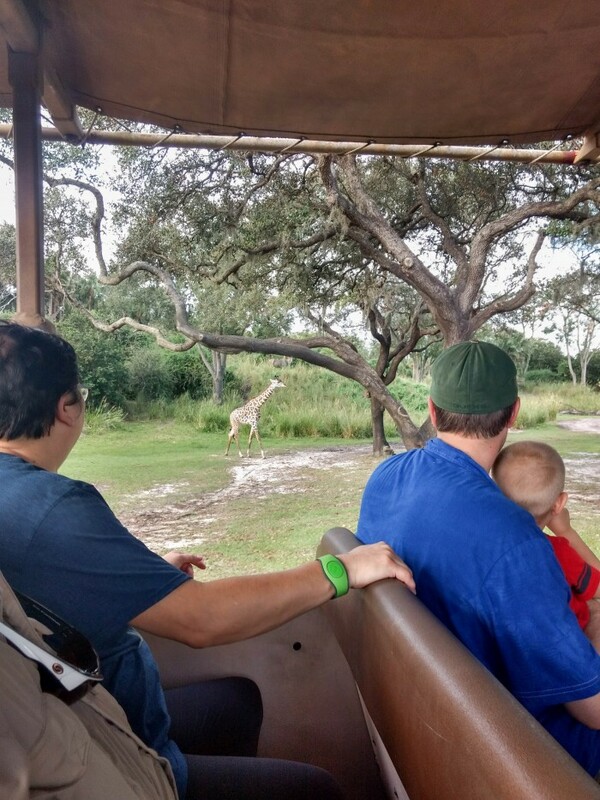 The top can’t miss attraction is the Kilimanjaro Safari Tour ride. It feels like you leave the park and really set out on a tour through the wild. It’s a long ride that takes you to see so many different animals and they’re so close and easy to view that it really is an incredible experience. By far, this is the #1 reason to take a trip to Animal Kingdom! 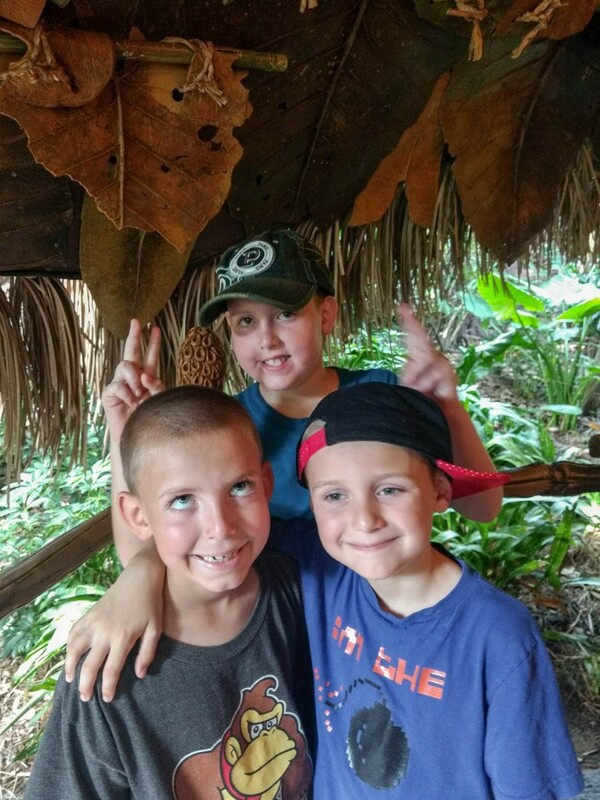 There are a lot of other animal exhibits throughout the park as well including exploration trails to spot tigers, gorillas, and other really cool animals. You’ll also want to make time to see Festival of the Lion King performance, which is my 2nd favorite attraction at the park. It’s really well made with lots of audience interaction. You can spend some time in Dinoland to get your fill of carnival style rides, the DINOSAUR ride that takes you back in time to hunt for a dino, and then dig and climb at The Boneyard playground. When it’s time to cool off, head to the Kali River Rapids – but be prepared to get wet! If you’re a fan of big coasters, Expedition Everest is a blast! You’ll start by winding up through the mountain only to run into a broken track that will send you spiraling back through the mountain side – backwards! You might – if you’re lucky – even score a picture as awesome, and hilarious, as we got of my 7 year old! A break away from the busy crowds from the day before, Discovery Cove is a park unlike any you’ve ever experienced before. The park has a limited daily admission and it really feels limited while in the park. There are no lines and the park feels like a relaxing break in the middle of the hustle and bustle of Orlando. You’ll spend the day snorkeling in the reef, that our group never wanted to leave. You can float the wind-away river that take you right through the aviary for a unique look at the colorful birds on-site. 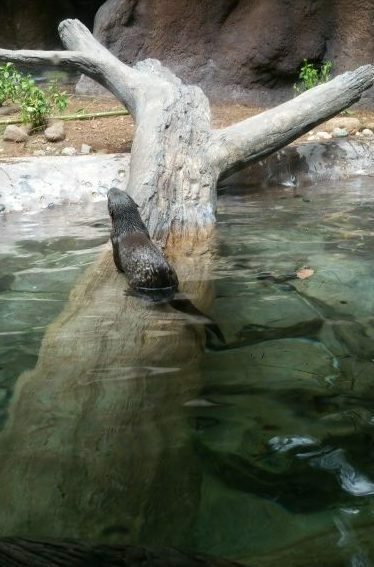 Or swim right up to see the otters or marmots with an up-close view. 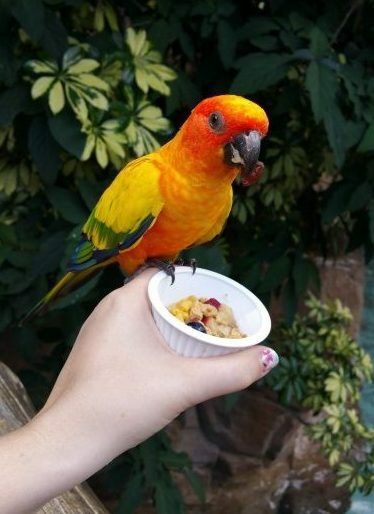 Hop out of the water to feed the birds in the aviary with no hidden upcharge – everything’s inclusive! 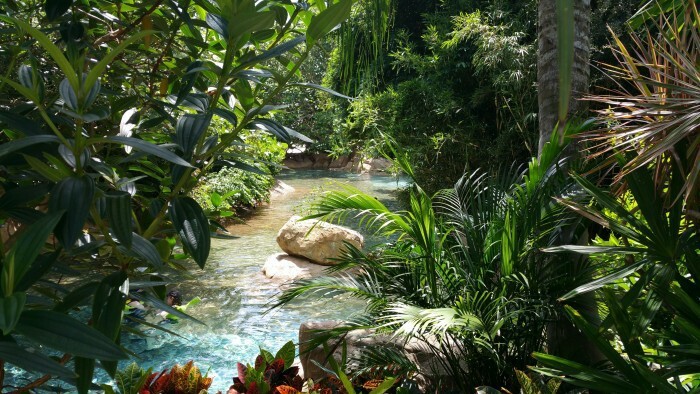 Discovery Cove provides wet suits or vests, snorkeling gear, even animal-safe sunscreen. You can add on an excursion in the park to make your day even more special, like a dolphin encounter or a swim with the sharks. You could even head deep into the reef with a Seaventures dive with a full helmet that takes all the training needed out of diving to give you a one-of-a-kind experience. You’ll even get all your meals included with your park admission meaning all you can eat breakfast, lunch, drinks and snacks all day throughout the park. My kids couldn’t believe that they could grab a slushy drink, pretzel chips, or cookies whenever they wanted, no begging for treats at this park! That means, parents can relax and enjoy this park as much as the kids. Plus, the park is beyond gorgeous and really sets the stage for a relaxing day. When it’s time to go, Discovery Cove has on-site showers, towels, and even shampoo and body wash included letting you clean up before you head home. 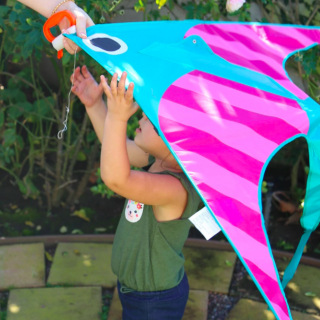 Plus, keep your snorkel with you as you’ll be able to take it home as a souvenir of your day! Your visit also includes 14-day admission to SeaWorld and Aquatica parks if you have extra time, making this park a great deal for all that’s included. 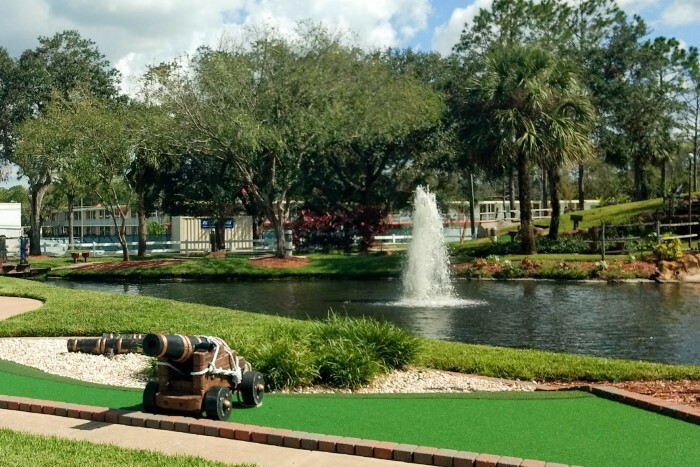 There are dozens of themed mini golf courses around Orlando and Kissimmee, and they’re worth the stop. Many of the courses aren’t just a flat, basic course. These mini golf courses immerse you in the theme and provide a challenge that makes this mini golf course even a challenge for the adults! Pick a course off your favorite theme – like pirates or gators! Aim for mini golf in the morning before the heat of the day and humidity hits. 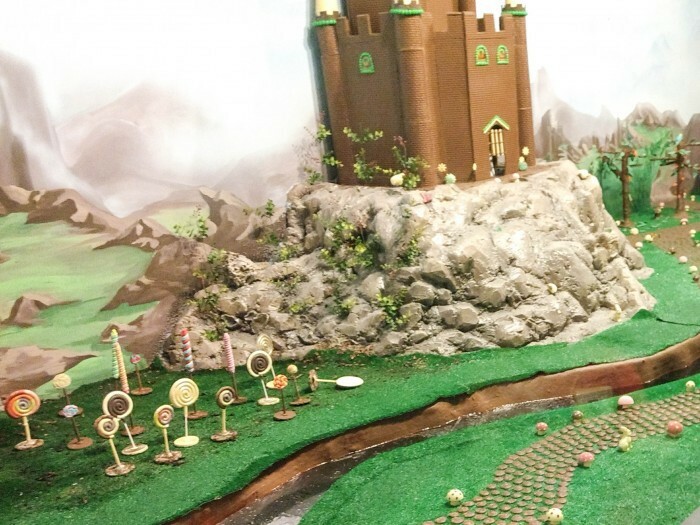 Chocolate Kingdom offers a tour that takes you through the chocolate making experience. You’ll be able to taste the beans, an early chocolate drink, and the syrup right before it becomes chocolate. My boys loved seeing the town made out of chocolate. There was another part of the Chocolate Factory Tour where we got to launch marshmallows into the mouth of a large dragon statue to help prevent him melting the chocolate. The tour is very interactive and engaging, plus educational! At the end of the tour, you can opt to make a personalized chocolate bar – and I highly recommend it. Pick your preferred chocolate and add up to 3 toppings. The chocolate bar, made exclusively with cocoa beans sourced from Ecuador, is so rich, creamy, and delicious. 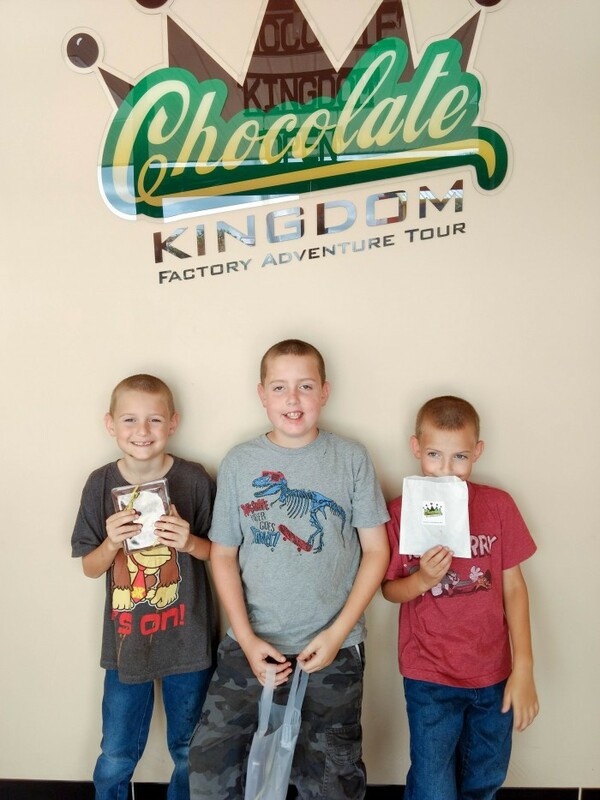 A few feet away from Chocolate Kingdom is Fun Spot’s Kissimmee location. This feels at first glance like a carnival with the rides you might expect, but they feel secure and safe (unlike those rickety carnival attractions!) 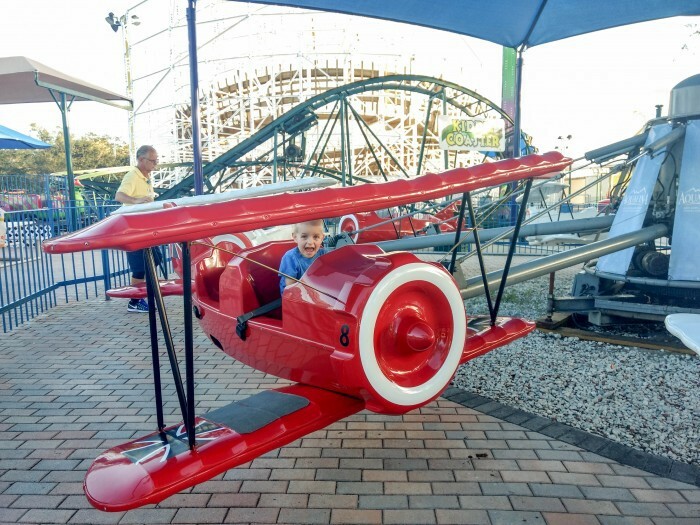 You’ll be able to race through two go cart tracks that are so much fun and lots of rides for every age including the Mine Blower coaster that’s so much faster than you’ll expect. We even discovered a whole area of the park dedicated to the little ones with a bunch of rides just for their size! My almost 3 year old is obsessed with airplanes, so as you can imagine he was all over their airplane ride that let him take off by pulling back on the lever. We went to Fun Spot on a school night when locals were in session and the park was very open and crowd-free giving us plenty of time to hit our favorite rides over and over again making this park one of our favorites from our trip. 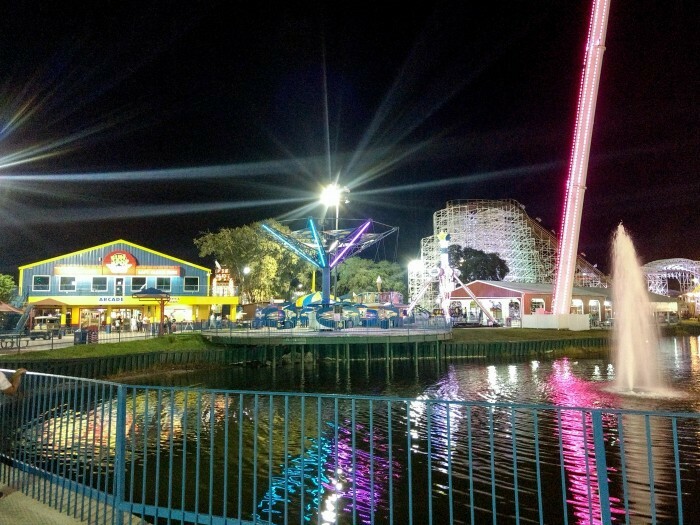 Fun Spot is open until midnight, so make sure your next day’s activities don’t start early. Chances are, your group won’t want to leave! 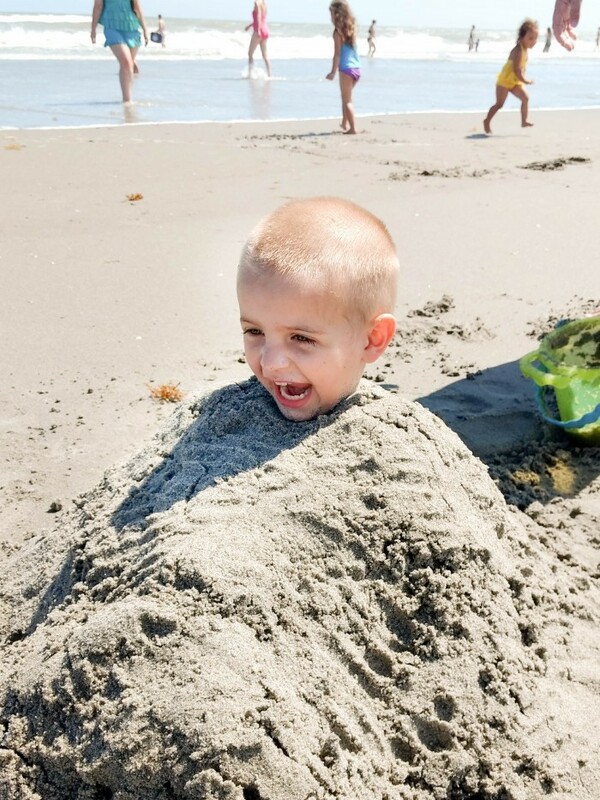 A beach day is a perfect way to go at a little slower pace then the rest of your packed full of thrills trip. You’ll leave tired from all the swimming and sun, but it won’t feel rushed and full of lines like everywhere else. It’s a perfect change of pace to add to the middle of your trip. There are several beaches to choose from within a short 2-hour drive. We went to cocoa beach, and really enjoyed our time, but any beach will do. Parking is inexpensive and plentiful, though dining and gas locations are fewer and far between on the coastal fronts. We brought boogie boards along with us and they entertained the kids for hours. 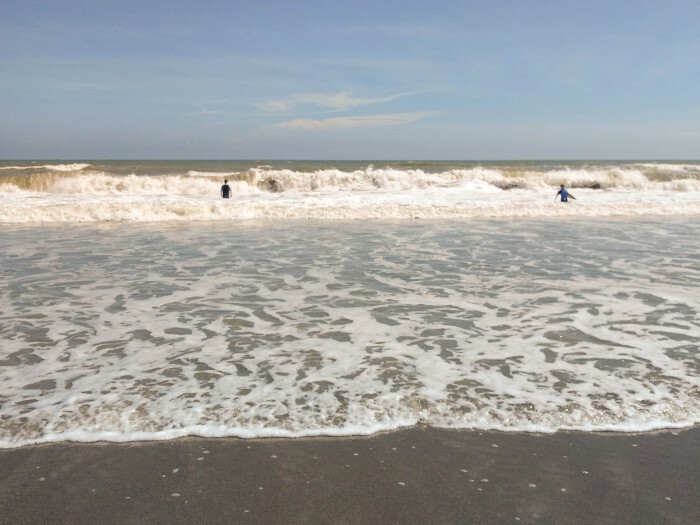 My 7 year old spent every second he could fearlessly riding in the waves. We also like to pack a lunch to allow us to stay longer at the beach front. That also helps to make this day easily the least expensive of the trip. As evening approaches, head to Universal’s City Walk to wander with the fun party vibe and make your way over to the Blue Man Group studio, situated right next to Universal Studios. 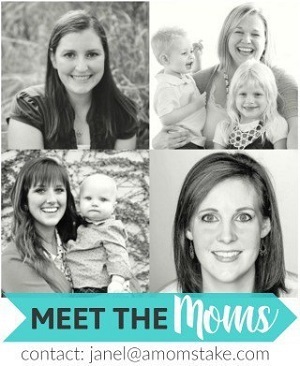 They have shows that start at 6 pm or 8 pm so you can choose the one that will work best for your family. You can go to the earlier show if you have young kids, or plan to come back from the beach and rest for a few hours before hitting the late evening show. 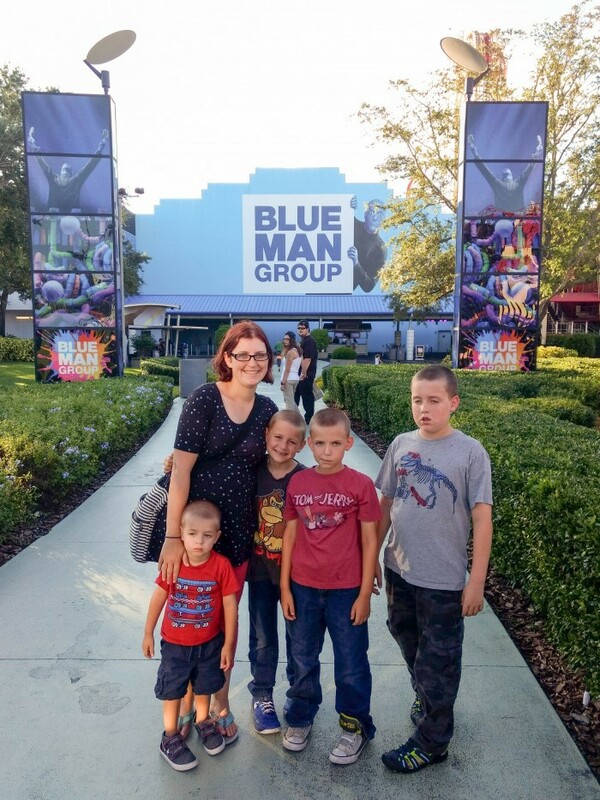 Either way, Blue Man Group should definitely have a spot on your itinerary. The show is one that will captivate all ages. My almost 3 year old as well as my 7, 9, and 11 year old boys were in complete awe and laughing throughout the show. But just because it was something my kids liked, doesn’t mean it was boring for kids. 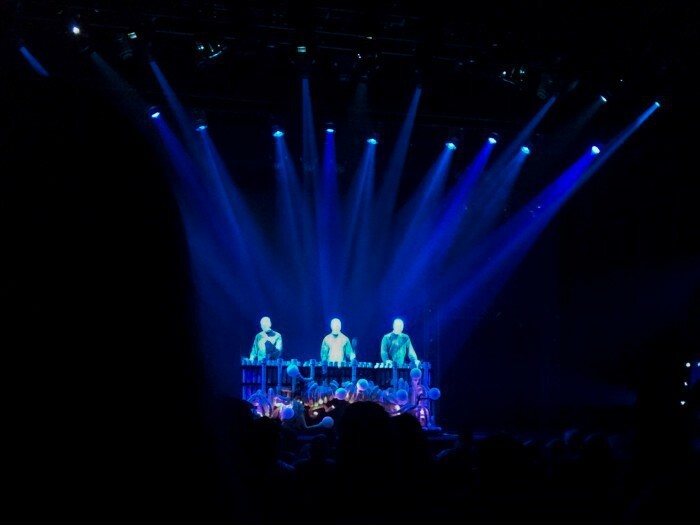 My husband and I both really enjoyed the Blue Man Group performance with the dance party, humor, music and audience interactions – it’s quite a display! A trip to Orlando would not be complete without a day spent at Disney’s Magic Kingdom – no matter your age! There is just a magical feeling there and attractions for everyone in your party. The best way to experience Magic Kingdom is during one of their special events, if you go at the right times of the year. Since we were in Orlando in October, we booked tickets to Mickey’s Not-So-Scary Halloween Party rather than a day pass. 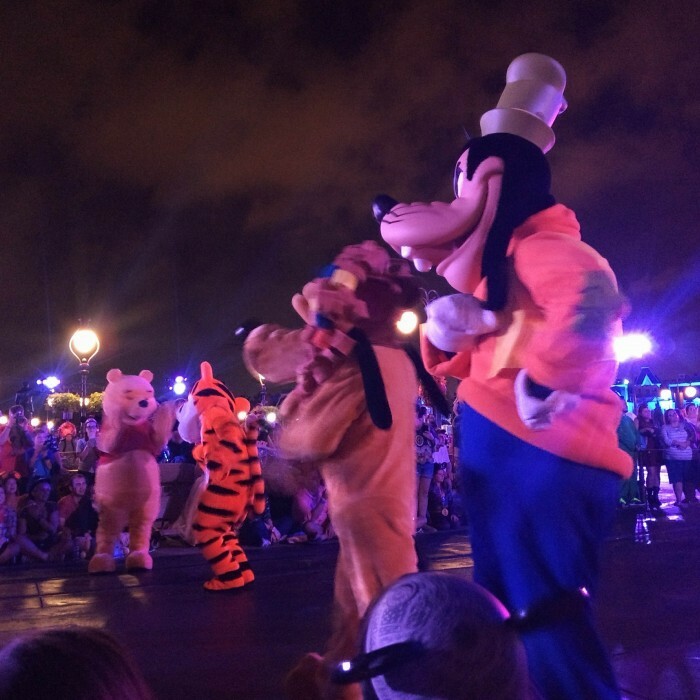 It was hands down the best experience I’ve ever had at Disney – and that’s saying a lot! With the limited park admission you’re able to ride the rides with hardly no lines at all! Most rides were under 10 minutes wait. Our longest wait time was for the Seven Dwarfs Mine Train. We waited 30 minutes for the ride – which usually has lines 2 hours or longer! 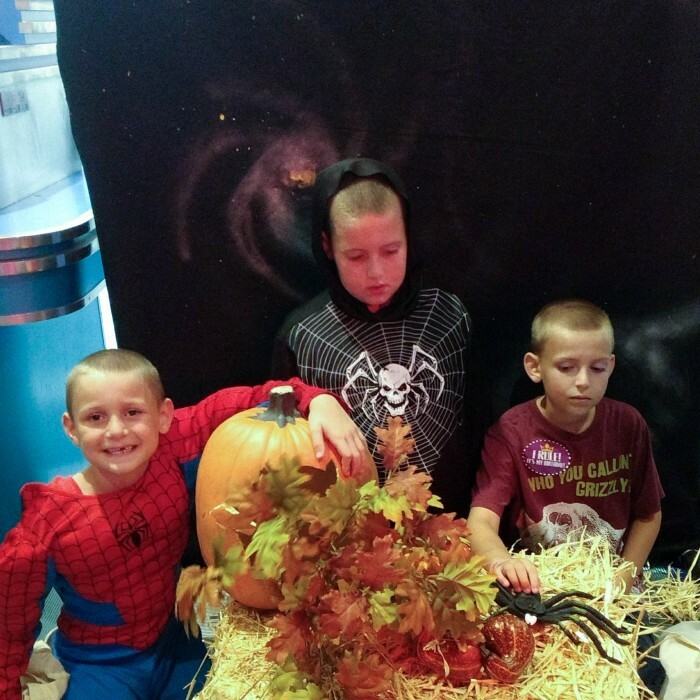 The Halloween party included trick-or-treating throughout the park, special character appearances, unique treats and event items available for purchase, and special shows only reserved for the event. 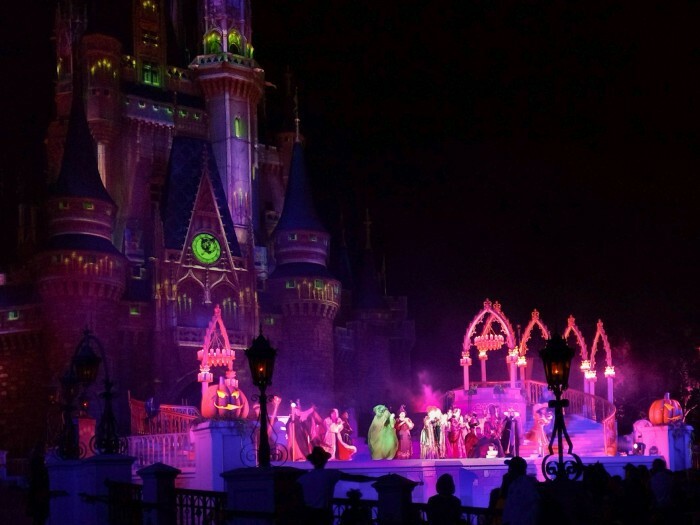 That included a special parade, fireworks show, and a live action performance of Hocus Pocus Villain Spelltacular. That show was so fun to watch, especially to see the castle light up in really fun ways, sing along with the music, and feel the energy and excitement from the audience. As you can see, there are tons of rides and attractions at Magic Kingdom – this list doesn’t even name all of them! There is just so much to see, do, and experience at the park. 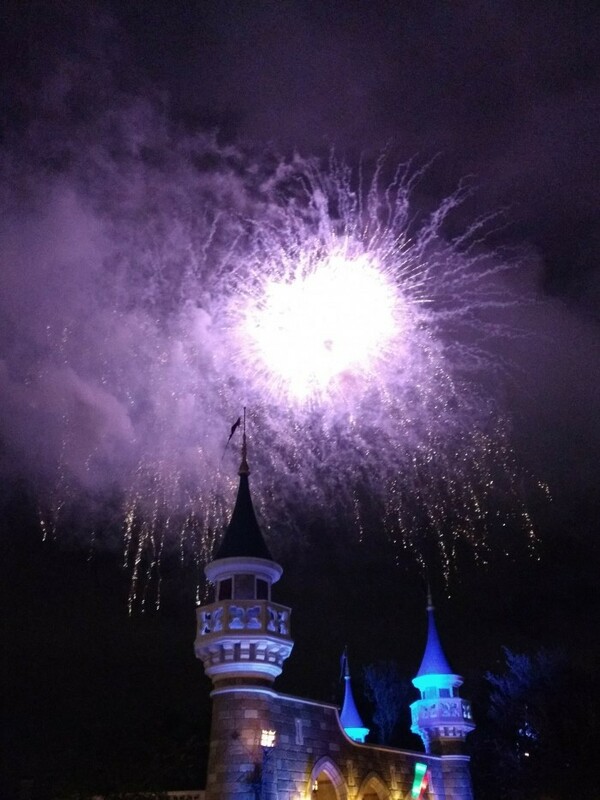 And of course, you have to end your night with the magical fireworks show. Don’t miss the parade as well, if you have young children with you. If you happen to be attending Mickey’s Not-So-Scary Halloween Party, I made a plan for our time (focused around the rides, shows, and trick-or-treat’ing – not character meetings). 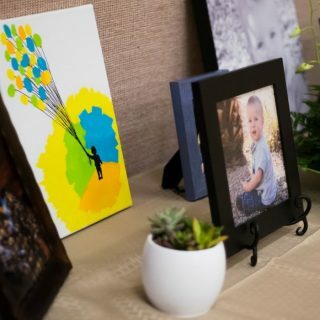 You can download our party plan to help you get started and then customize it to fit your own game plan for the party! The park starts letting in party go-er’s at 4pm, even though the event doesn’t start until 7, so make sure you get the most out of those early hours by being to the park on time and with a plan! We like to make our last day a little slower pace, to spend at least part of the day unwinding from a full of fun week. A great way to do that is with a single activity in the middle of the day to get you out of the house and then an evening show. You can also cram in some time at the pool at your resort, if your group is so inclined. We chose to spend the day at an escape room. 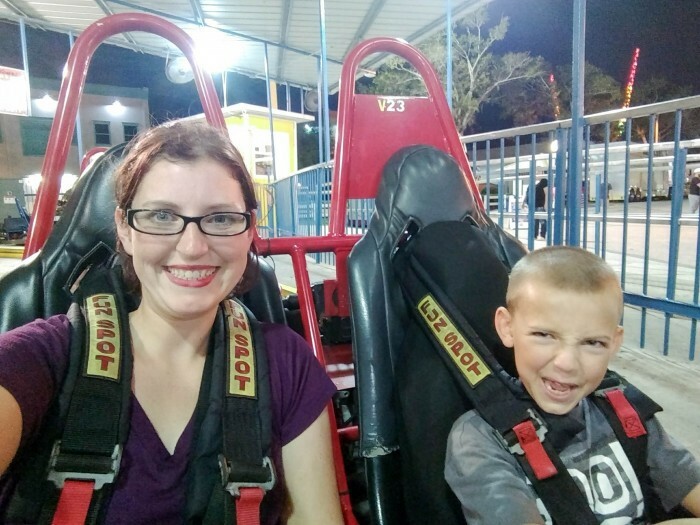 It’s an activity my husband and I have done on group date nights several times and something I thought my kids would really enjoy. You’ll notice a variety of escape rooms everywhere you turn while in Orlando. They’re a lot of fun and you’ll be surprised how much your kids aged 7+ will be able to help and participate in solving the puzzle. If you’ve never experienced an escape room before, you’ll want to choose an easy room to get started as your hour to solve the puzzle goes quick, especially with kids in tow. 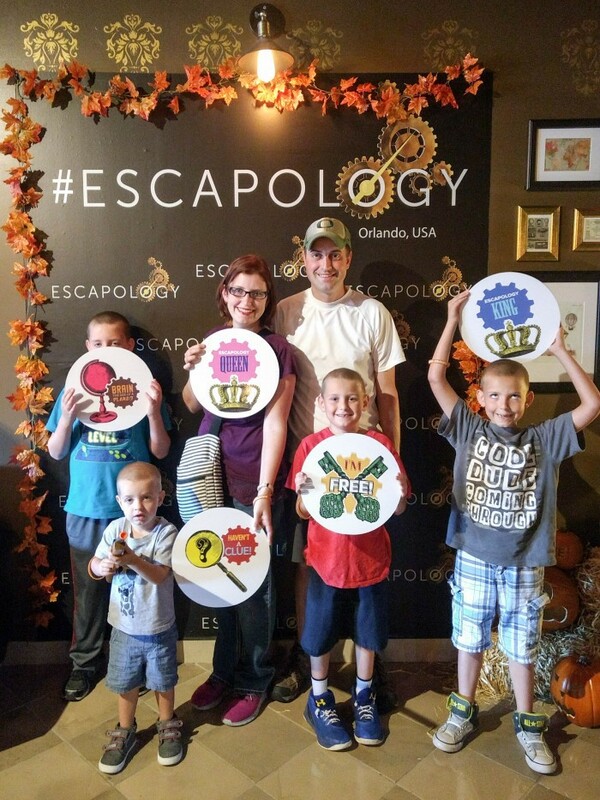 We booked an escape room through Escapology Orlando as they could accommodate our young children (including my 3 year old) in the room, not all escape rooms are kid-friendly. Their Budapest Express themed room was a lot of fun, and a good challenge, that we escaped with less than 5 minutes to spare. Your group may find a different escape room company is better suited, but either way this is a fun attraction that the puzzlers in your group will really enjoy. 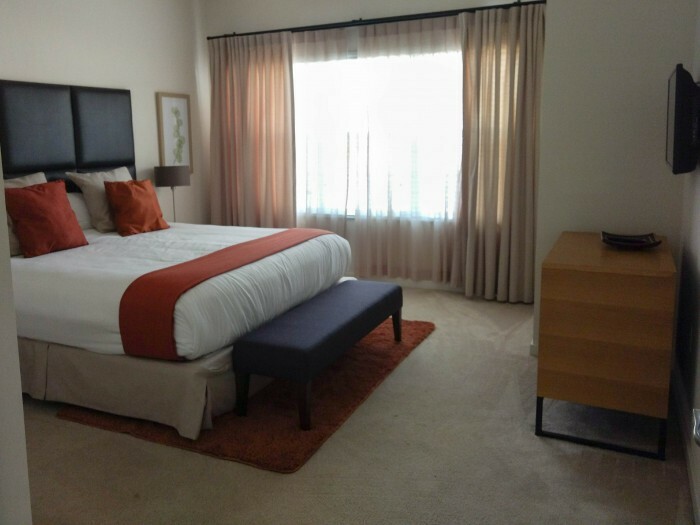 Afterwards, you can head back to your resort and spend some time packing and getting everything ready for your departure the next day while the family rests and relaxes like a vacation calls for. 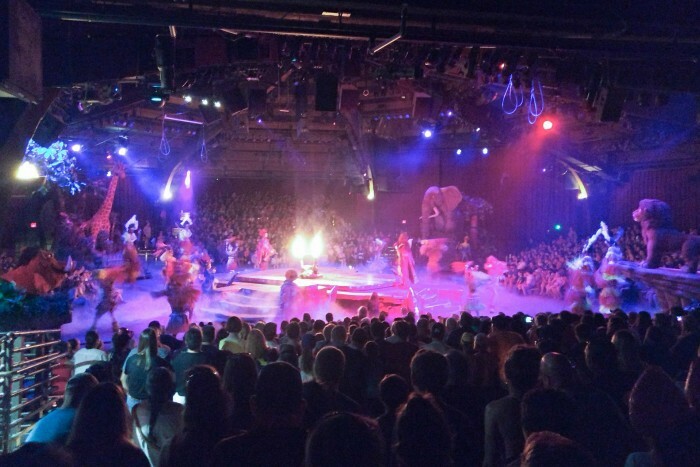 The perfect ending to your Orlando family vacation is an evening show! 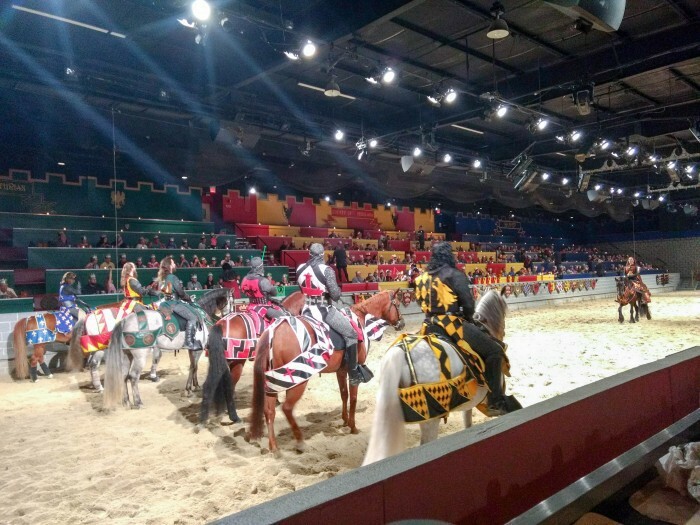 We went to Medieval Times, a tournament of knights including jousting, sword fights, falconry, and horses. It was quite the show! You’ll be seated in one of 6 colored sections to route for your knight as they complete a series of games and then eventually all out battle to be named the champion. The show completely captivated the attention of my 7, 9, and 11 year old boys. They loved waving their flag to cheer on the red knight and were in awe at the battles. The ticket price includes a meal as you are at a feast presented by the King himself. The food was really good, and much better than anticipated with very large and filling portion sizes. Sometimes dinner and a show lacks good quality food, but not Medieval Times – the food was just as good as the show! Our meal included tomato soup and garlic bread, nearly one-half of a rotisserie chicken, corn on the cob, potato wedge. The meal ended with a slice of lemon cake. Drinks are included as well, making the meal and entertainment a great value for all that you receive. We all went away stuffed and with extra food left on the plate (a bag was provided to pack leftovers home). Be warned, you will eat with your hands – which just adds to the fun of the evening experience! 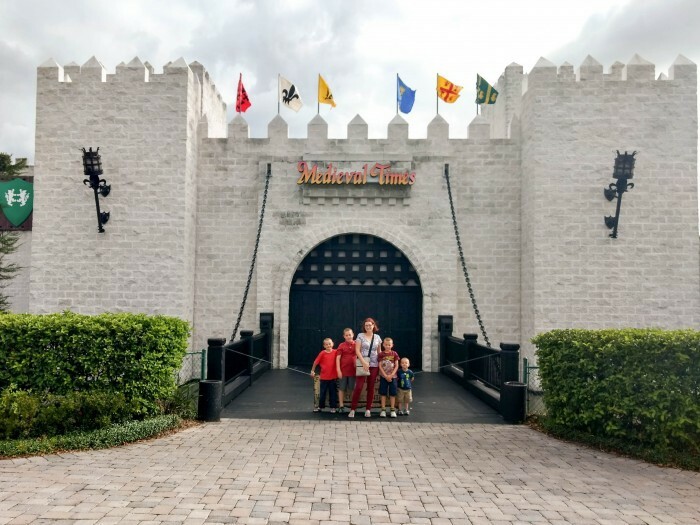 We had such a good time rooting for our knight with no dull moment to spare with the food, entertainment, and cheering taking place throughout the 2-hour Medieval Times show. If you have a family, staying in hotels is really difficult – especially for a week long trip! There’s no rooms to separate adults and children and space to let the family spread out and be comfortable for the stay. On our recent trip to Orlando, we stayed at Regal Oaks Resort. They offer townhomes with 2 separate bedrooms, a full family room and kitchen, and 2.5 baths. 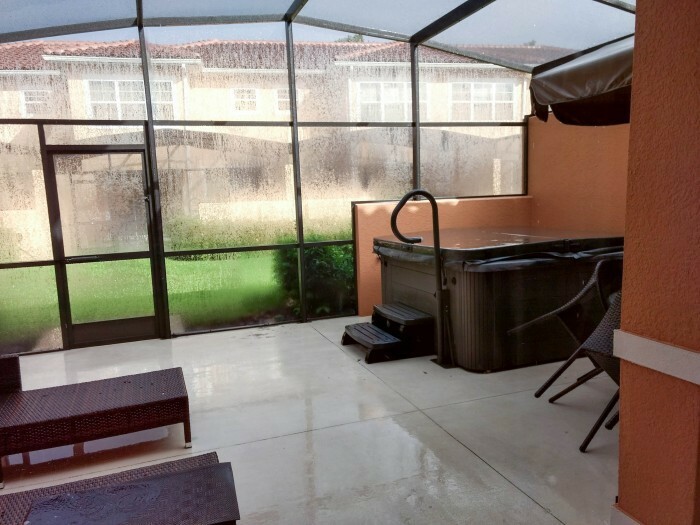 You’ll also have access to a private patio and hot tub! Staying there gave my family of 6 space to relax when we weren’t out hitting the parks. We were able to cook our own meals and ate breakfast in the townhome almost every morning. We also cooked some lunch and dinners for times where we didn’t have other plans. It’s fun to dine out, but it also gets expensive quickly and restaurant or fast food meals all start to feel the same after a while. 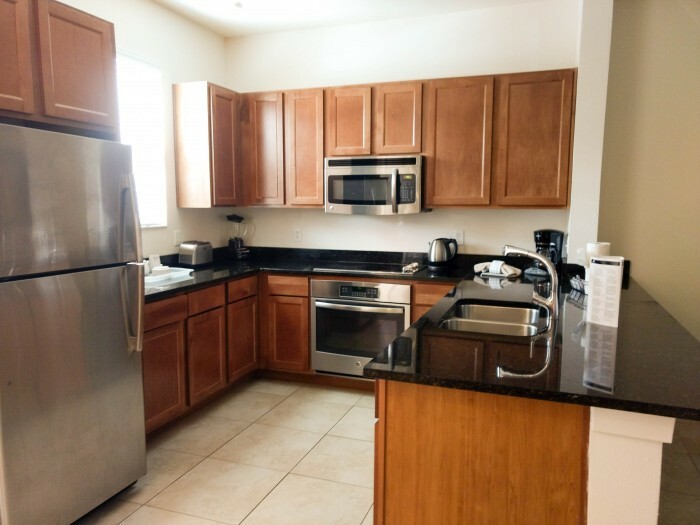 Sometimes it just more convenient, and easy, to just cook a quick meal from home before heading out to your activity of the day and Regal Oaks made that so easy for us with the full kitchen stocked with dishes, cookware, and a full sized fridge. The resort had a beautiful pool and water slides available for guests and a kids program pool side with crafts, activities, and games! Our favorite, though, was our private hot tub. It was the perfect way to unwind after a hot and sweaty day in Orlando’s humidity. It was just so relaxing and really fun for all of us to pile into the hot tub and soak for a few minutes before heading up to showers and bed for the night. If you’re looking for an affordable place with lots of space that’s within easy access to all that Orlando and Kissimmee has to offer, Regal Oaks Resort is a great option. Everything was within a 25 minute drive from our stay, except the beach. The Disney parks were only about 15 minutes from where we stayed, it was so convenient. Plus, Fun Spot is right beside the resort and lots of dining and shopping options as well. A really great resource to find information, attractions, accommodations and more is on the Experience Kissimmee tourism page. Kissimmee is the neighboring town to Orlando and very convenient access to all the parks. Most everything was within 20 minutes drive from Regal Oaks Resort in Kissimmee where we were staying. 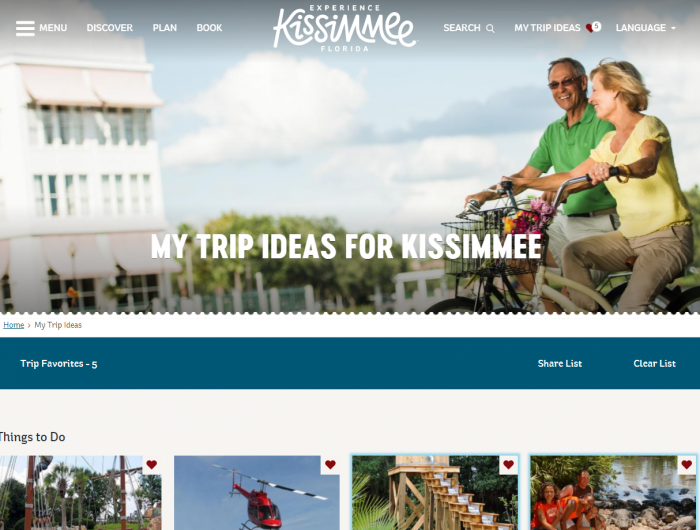 You can use the Experience Kissimmee website to help you discover attractions and accommodations to start early vacation planning. When you find something that interests you, just mark the activity with the little heart in the top right corner and you’ll be able to stash your trip ideas to easily browse later as you finalize your own itinerary. It’s super helpful for stashing away ideas for later – no login required! Another great benefit is they help source deals, discounts, and promotions to help you save money on your upcoming family trip. You can find all sorts of visitor information or even grab a free vacation guide to help your early planning. 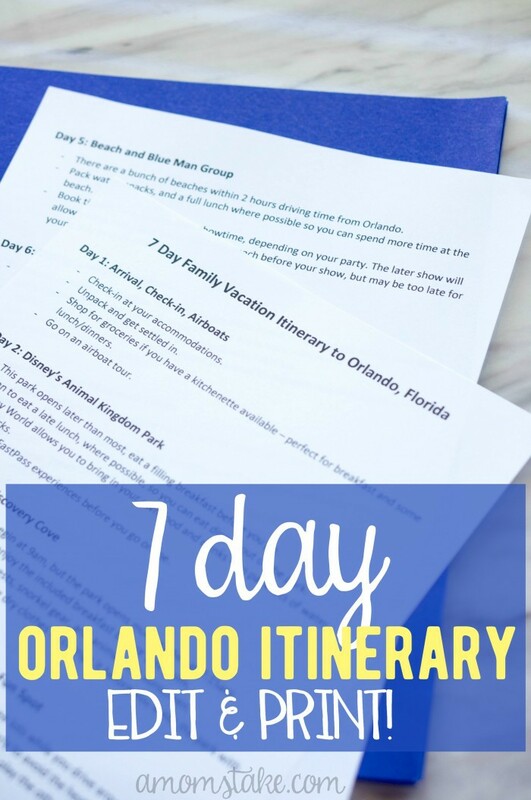 If this vacation plan is right up your alley, you can grab our free family vacation to orlando sample itinerary along with extra tips to help you prepare for each day. With the Word format, you’ll be able to make any adjustments to the schedule to change around the days or swap out attractions – plus add your own notes including your confirmation numbers or other details, right to your itinerary so you have everything easy to access in one spot! When it’s time for your vacation, just print out your itinerary and any booking confirmation emails you may need and stash them all together in a pocket folder so they are easy to find and take with you each day. Wow! Orlando seems like so much fun, especially when you’re with the closest ones, Janel. Is one week enough to enjoy all of the activities in central Florida? You guys covered so much ground on your visit! So fun! 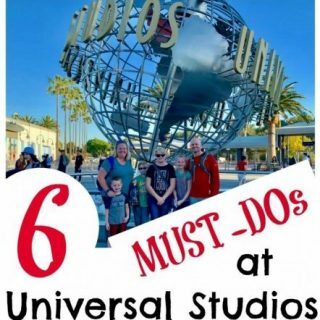 We have been in Orlando twice this year and there are defiantly things you mentioned like Sea World and the Chocolate Kingdom that I would love to go back and see! What a fun packed itinerary. I would love to visit Orlando. I must say that the expression on your 7 year old’s face is hilarious in that pic. My husband and I both bust up at it still every time we see it!! Wow, I didn’t realize there was so much to do in Orlando. I mean I knew about Disney but you went above and beyond. I so want to go to Orlando! For sure, there is so much to do in Orlando. 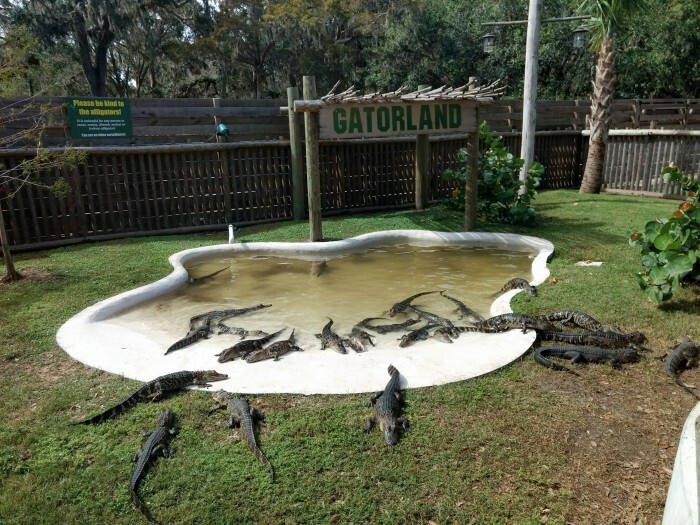 My family especially loves Gatorland, a small but very engaging theme park that specializes in gators. Years later my kids still talk about our visit there! What a great itinerary for Florida. 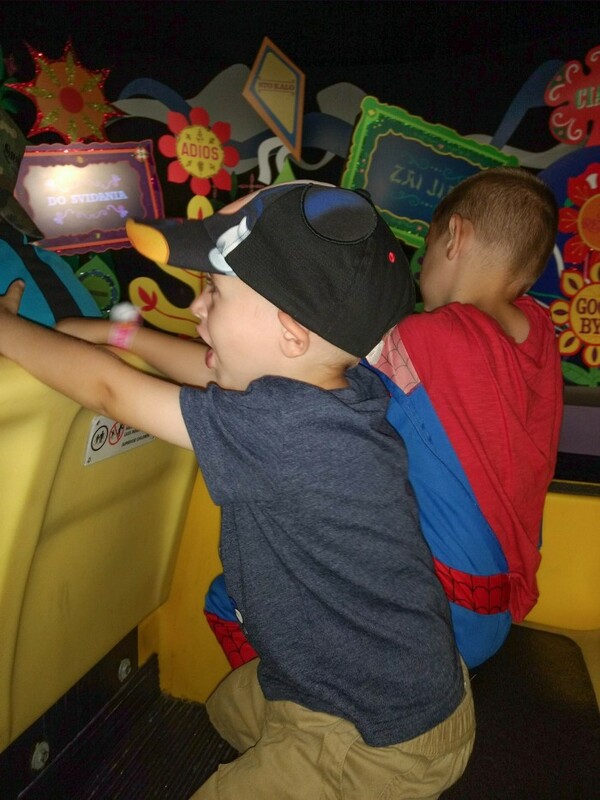 There’s so much to do in Orlando with the kids it can sometimes be overwhelming. Your itinerary was jam packed FULL of amazing things to do in Orlando. I would love to take an Airboat tour. I’ve been hearing how much fun they are. It looks like the whole family had a great time! We love Orlando! We’re taking a family trip there again soon. You’ve touched on a few things we’ve yet to do though so I might just be revising our plans. What a fun itinerary. I haven’t been to Orlando in years and it has changed so much. I’d love to go back. Your Orlando trip sounded amazing! I always love visiting the Magic Kingdom. We loved our first Medieval Times show too! Orlando is on my travel bucket list. I think I am the last person on earth who has not seen this amazing place! Florida’s one of our favorite wintertime destinations. 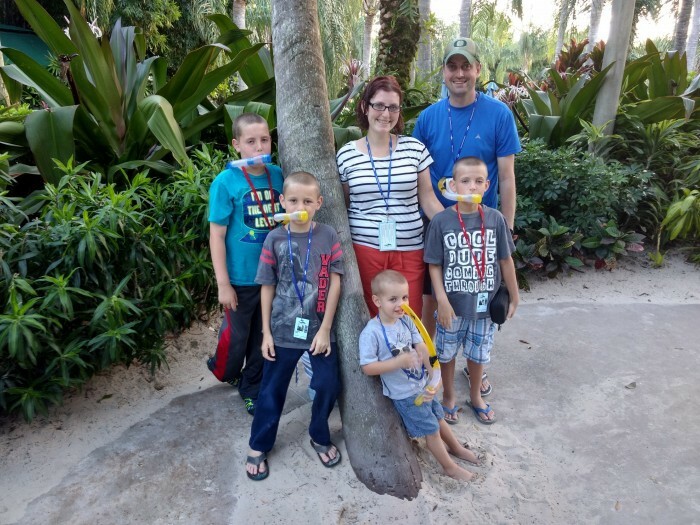 Orlando is a great place to go with your family. There are so many different things to do there. Definitely something for everyone. What a magical and memorable family trip to Orlando. There is so much to do there. 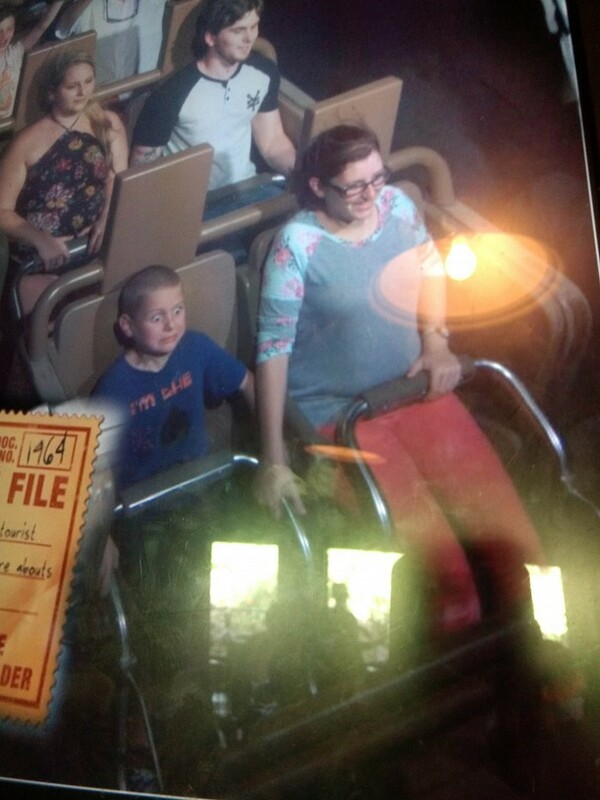 The photo of you and your son on the Expedition Everest are hilarious. Orlando is the best place to take you family, bar none. We love it there. We’ve been to Disney, Universal, Gator Land, and a bazillion putt putt golf courses. That is one jam packed trip! Orlando has so much to offer families. We go there as often as we can. It looks like you all had a blast! Whenever I think of Orlando I think of Walt Disney World but there is so much more than just disney. If I ever get down to Orlando I will definitely check out other things besides Walt Disney World. This place really looks amazing for a family vacation. Thanks for sharing your review.